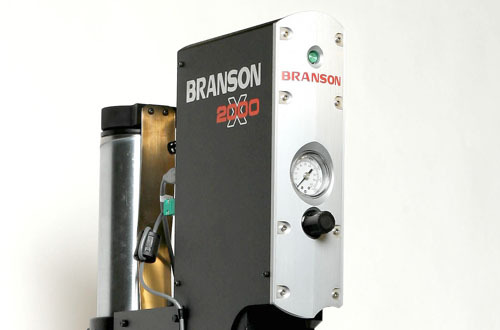 Branson was developing a new family of laser welders for the plastics industry. These products would feature unmatched performance and flexibility in a completely modular system approach. The family consisted of controllers and actuators. The 3G (shown in the middle) is a compact bench-top controller and the 3I (shown on the left) is a free-standing controller. The 2000X actuator offers a precisely - controlled method of delivering the tooling to the work-piece and generating clamp force. Branson came to Compass to help provide a new, fresh image to convey the performance of the new family. We created a brushed sheet metal face plate that provides a feeling of precision and quality. To help minimize color mismatch issues, we chose black for the main body color.